Here at From the Shadows we are counting down to Valentine's Day with some fabulous giveaways! 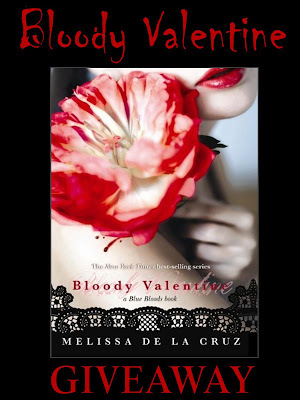 Enter to win a copy of Bloody Valentine: A Blue Bloods Novella by Melissa de la Cruz. To enter, please leave a comment on this post including your email address (so we may contact you if you win). This giveaway is international (to anywhere The Book Depository ships)! Giveaway ends February 14th midnight EST. I would love to read this. Please enter me in the giveaway. Please enter me! Sounds AWESOME! I would love to read this too! Awesome! I so want to read this! Another great giveaway EJ. Thank-you. Please count me in! I would love to read this. Thanks so much for the giveaway! Looks like a bloody good read! Thanks for hosting! Sounds great Have not read eny of her books yet.But would love to. I like the cover. If I win, this would be the first time I'll be reading a book of Melissa's! Pretty Cover ! I'd love to read this. Super thanks! I just followed your Twitter and GR account! Plus I'm your follower! See'ya soon! Cool giveaway. Thanks for the chance! I absolutley love this series! I'd love to win this! Thank you SO much for this giveaway!!! Great giveway...I just recently read this series...but haven't read this novella yet! The cover of this book is beautiful! This looks interesting.I would loooove to be included in the giveaway. Vampires, just my cup of tea! Perfect book so close to Vday! +1 for GFC, Goodreads and Twitter. Have no idea what GFC is what a goober, huh? Bloody Valentine looks great!!!! I love the cover also. Sounds like a good read. Add me to the list please. Oh, I love the cover of this one. Looks like a great read. Wow, totally love this cover. Thanks for the comp. Thanks for a chance at a great giveaway! Taylor:this sounds awsome thanks for the giveaway. Thanks for the awesome giveaway!!!!!!!!! Thanks for the contest! Love the Blue Blood series! What a great contest! Lost the author!! Hope I win!